This time I took a sketch of the Friday Sketchers to combine it with the themes of Cute Card Thursday and the Wednesday Stampers which both said: Take some snowflakes to create your object. So I created a card and I hope you'll like it ! oh wie toll, die karte ist ja ganz zauberhaft, auch die farben bringen ein weihnachtliches flair ... gefällt mir sehr gut. vielen dank für deinen beitrag zu meinem sketch bei den friday sketchers. Cute card, like the colours you used. 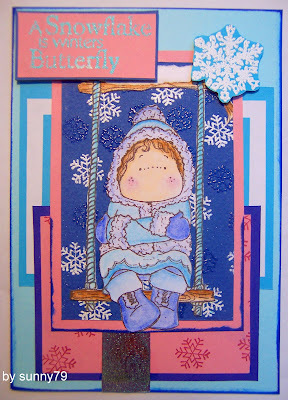 Lovely card - love the idea of a cold Tilda on a swing! A lovely card, luv the colours you have used. sue. Aw such a sweet card, love that image.